Mermaids… to most, they're the subject of myth and legend, but at Aquarium Restaurant, we've got our own sea of mermaids! Watch the mermaids swim amongst their sea life friends, all while teaching about the importance of taking care of our environment, during this 10-minute interactive show. Their family-friendly show is choreographed to music and is performed in our dining room aquarium tank. People are always asking us about our mermaids! Click here for fun facts about what it takes! Must call to reserve your spot! Mystic Mermaid schedule is subject to change without prior notice. ** Mermaid Meet and Greet after first performance (unless otherwise noted). Fun facts about what it takes to be a Mystic Mermaid. Our mermaids swim 3-6 shows per month. 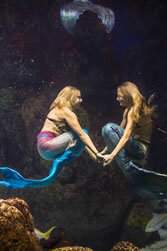 Mystic Mermaids are CPR certified and trained on emergency water evacuation rescue. The mermaids are not all scuba dive certified. The water is a temperature of 78 degrees. The mermaids free dive, with no weights, no underwater air supply and no goggles. Salt water is impossible to see in, so the mermaids are trained to do their entire performance without clear vision! 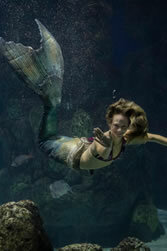 The Mermaids current routine is a performance geared toward children. The show has conservation messages teaching kids how to care for the ocean and about recycling. Swim 200 yards - timed. 50 yard butterfly stroke – timed. There is also a performance evaluation in the exhibit. To apply to become a Mystic Mermaid please stop by the restaurant and fill out an application. Barracuda, Black tipped shark, Drum Fish, Shovelnose Guitarfish, 150lb Queensland Grouper, Butterfly fish, assorted Tangs, Look Down Jacks, Green Moray Eels, Tessellated Eels - and many other schools of fish.